Gabon is a developing nation on the western coast of central Africa. French is the official language; few Gabonese speak English. tside the capital city, Libreville, are available, but they are often limited and can be expensive. 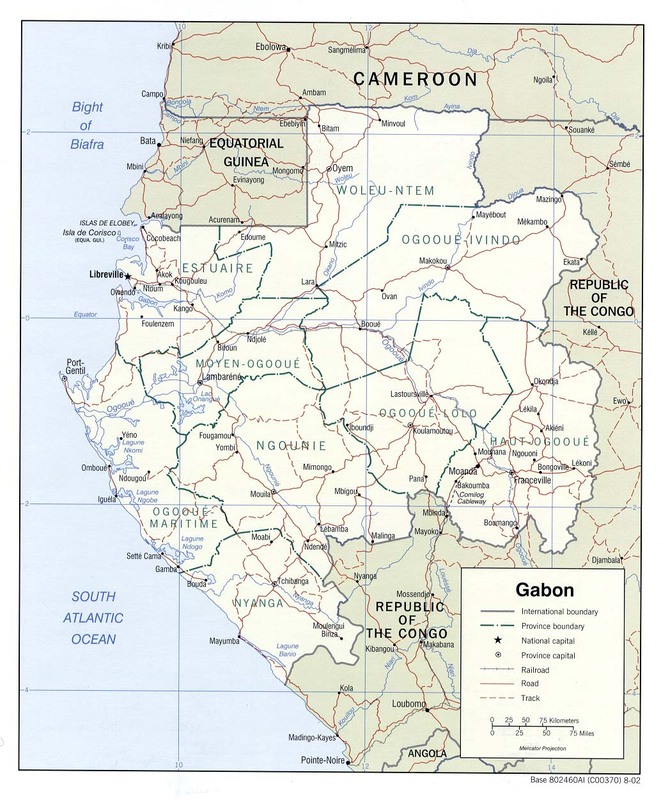 Read the Department of State Background Notes on Gabon for additional information. Proof of yellow fever vaccination is required for entry. Visas must be obtained in advance, as airport visas are no longer available. 20009, telephone: (202) 797-1000, fax: (202) 332-0668. Travelers may also contact the Gabonese Consulate at 18 East 41st St., Ninth Floor, New York, NY 10017, telephone (212) 683-7371. Overseas, inquiries should be made to the nearest Gabonese embassy or consulate. All non-Gabonese citizens, with the exception of those bearing diplomatic or official passports, are required to obtain exit visas from the Direction Générale à la Documentation et l’Immigration (DGDI, formerly known as CEDOC) before departing Gabon. There have been isolated incidents of civil unrest within the past year, both in the capital city and in the interior. Large gatherings such as sporting events or any other event where crowds have congregated to demonstrate or protest should be avoided. The Embassy informs the registered resident American community of security matters through a warden system (please see the Registration/Embassy Location section below for more information). In the event of a fire, dial 18. In Gabon, petty thievery is common. Violent crime is more common in urban areas, and there have been cases of armed robberies in homes and in restaurants frequented by foreigners. Occasionally Americans or Europeans have been victims of crime. The U.S. Embassy encourages Americans to take extra precautions when traveling in Libreville. To prevent carjacking, citizens are encouraged to travel with their automobile windows up and doors locked. Marginal neighborhoods, poorly lit streets, and unfamiliar areas of the city should be avoided, especially at night. Walking or running on the beach alone at night should be avoided. If involved in an attempted robbery or carjacking, Americans are encouraged to comply with the attacker to avoid injury and to report all incidents to the police and the U.S. Embassy. Scams or confidence schemes do occur in Gabon. For general information on scams, see our Financial Scams webpage. Credit cards are not widely accepted except at hotels, and because of the high rates of credit card fraud, their use outside major chain hotels is not recommended. There have been incidents of sexual assault against foreigners. The local equivalent to the “911” emergency line in Gabon to reach the police is 177. Medical facilities in Gabon's major cities are limited, but they are generally adequate for routine or basic needs. Medical services in rural areas are generally unavailable. Additionally, some medicines are not available; travelers should carry necessary, properly labeled medications with them. The U.S. Department of State is unaware of any HIV/AIDS entry restrictions for visitors to or foreign residents of Gabon. The information below concerning Gabon is provided for general reference only, and may not be totally accurate in a particular location or circumstance. Travel by road in Gabon can be hazardous. It is recommended that you drive with your car windows up and the doors locked. Travelers are routinely stopped at police checkpoints within cities and on roads to the interior. Americans should comply politely if stopped, but avoid encouraging bribery if possible. Travelers should use extreme caution when driving after dark. Two-lane roads are the norm throughout Gabon. Roads to outlying cities have visible and hidden dangers that are profuse, including large potholes, absence of road signs, poor to non-existent streetlights, and the presence of pedestrians and animals. Construction work is often poorly indicated. Four-wheel drive vehicles are recommended for travel beyond the paved road to Lambarene, especially during the rainy season. Roadside assistance and emergency medical services are available in Libreville, but they may not be dependable. Such services are nonexistent outside of the city. Service stations are available along main roads, but vehicle repair facilities are not always available. Drivers must have a valid international driver's license (available from AAA and the American Automobile Routing Alliance) when driving in Gabon. Use of taxis is generally safe but does pose added risks. It is recommended that one use a hotel taxi when possible. Before riding in a taxi, check that the taxi has seatbelts and agree on a fare. Riding in a taxi alone or during late hours of the evening is not recommended and creates additional risk of becoming a victim of crime. Rail services are available, but infrequent, and travelers should be prepared for delays. As there is no direct commercial air service to the United States by carriers registered in Gabon, the U.S. Federal Aviation Administration (FAA) has not assessed Gabon’s Civil Aviation Authority for compliance with International Civil Aviation Organization (ICAO) aviation safety standards. Gabon is a francophone country; travelers who do not speak French will face difficulties associated with the language barrier. Americans should always carry identification with them in the event they are stopped at a police checkpoint. Taking photographs of the Presidential Palace, military or other government buildings is strictly forbidden. Official corruption is common, but offering bribes is not recommended. Gabon is largely a cash economy. Travelers’ checks can be cashed or dollars exchanged for Central African Francs (CFA) at hotels and banks. ATMs are available in major urban centers, and dispense CFA. Persons violating Gabonese laws, even unknowingly, may be expelled, arrested or imprisoned. Penalties for possession, use, or trafficking in illegal drugs in Gabon are severe, and convicted offenders can expect long jail sentences and heavy fines. Americans living or traveling in Gabon are encouraged to register with the nearest U.S. Embassy or Consulate through the State Department’s travel registration web site so that they can obtain updated information on travel and security within Gabon. The U.S. Embassy is located downtown on the Boulevard du Bord de Mer. This replaces the Country Specific Information dated November 5, 2007 to update sections on Safety and Security, Crime, Information for Victims of Crime, Medical Facilities and Health Information, Traffic Safety and Road Conditions, and Special Circumstances. The World Health Organisation has declared Gabon a "polio-free country", given the lack of new reported or suspected cases in the central African country. According to a WHO statement obtained by AFP on [Sat 16 Dec 2017], the UN health agency nonetheless recommended taking the necessary steps to continue monitoring for possible signs of the disease. Gabon's Health Minister Denise Mekam'ne Edzidzie also urged families on [Sat 15 Dec 2017] to "continue to immunise children and prevent a resurgence of this disease." Polio is a highly-infectious viral disease which mainly affects young children and can result in permanent paralysis. There is no cure and it can only be prevented through immunisation. Cases of polio have decreased by 99 percent since 1988, when polio was endemic in 125 countries and 350 000 cases were recorded worldwide. [Positive news as another country in Africa is declared polio-free. The most recent confirmed case of WPV associated disease in Gabon was reported in 2011 (<https://extranet.who.int/polis/public/CaseCount.aspx>) when there was an outbreak associated with an importation from Angola (see ProMED post Poliomyelitis - worldwide (07): update http://promedmail.org/post/20110512.1462). Of note, reviewing the surveillance data available, since 2000, there has only been one confirmed WPV associated case in Gabon (in 2011), with "compatible" cases reported in 2000 (3 cases), 2001 (3 cases), and 2015 (3 cases). Libreville, Dec 16, 2017 (AFP) - The World Health Organization has declared Gabon a "polio-free country", given the lack of new reported or suspected cases in the central African country. According to a WHO statement obtained by AFP on Saturday, the UN health agency nonetheless recommended taking the necessary steps to continue monitoring for possible signs of the disease. Gabon's Health Minister Denise Mekam'ne Edzidzie also urged families on Saturday to "continue to immunise children and prevent a resurgence of this disease". Polio is a highly-infectious viral disease which mainly affects young children and can result in permanent paralysis. There is no cure and it can only be prevented through immunisation. Cases of polio have decreased by 99 percent since 1988, when polio was endemic in 125 countries and 350,000 cases were recorded worldwide. Now the disease is endemic only in Afghanistan and Pakistan, where the WHO recorded four cases this year -- two in each country. Last year, there were 37 cases globally. Miami, Sept 1, 2016 (AFP) - Tropical Storm Hermine picked up speed Thursday as it barrelled down on the US state of Florida, where it was expected to make landfall as a hurricane, forecasters said. A hurricane warning was in effect for northern Florida, the Miami-based National Hurricane Center said, warning of potential strong winds and storm surges that could cause flooding. "Hurricane conditions are expected to reach the coast within the warning area beginning tonight," the National Hurricane Center said. "Preparations to protect life and property should be rushed to completion." With the tropical storm approaching, intensifying winds threaten to make outside preparations "difficult or dangerous," it added. Governor Rick Scott declared Wednesday a state of emergency in 51 counties to free up resources to brace for the storm. The center of Hermine is expected to be near the Florida coast in the warning area by late Thursday night or early Friday, forecasters said. They warned of potentially "life-threatening inundation" along Florida's western coast on the Gulf of Mexico. Tropical Storm Hermine picked up speed as expected and was moving north-northeast near 12 miles (19 kilometres) per hour, according to the NHC report. Its maximum sustained winds strengthened to 65 miles per hour, nearing the minimum 74 miles per hour of a category one hurricane. The Atlantic hurricane season runs June 1 to November 30, but this year's first hurricane, Alex, formed in January in an unusual weather event. Earlier this month, the season's second hurricane, Earl, left more than 45 people dead in Mexico. The 2015 season was less active than average, with 11 tropical storms in the Atlantic, of which four became hurricanes and two major hurricanes. Libreville, Aug 31, 2016 (AFP) - Angry protesters set fire to Gabon's national assembly on Wednesday as thousands of people took the streets after an announcement that President Ali Bongo had been re-elected, witnesses said. "The whole building is catching fire," said a man at the scene called Yannick. AFP journalists further away saw a plume of fire and smoke rising into the air above the building. "They got in and burned it," Yannick told AFP, saying the security forces had pulled back from the area. They had been deployed there since Tuesday afternoon, when the results were initially due to be published. The national assembly lies on the same road as several important institutions, among them the senate, the oil ministry, several embassies and the headquarters of state television. The clashes erupted as soon as Bongo was declared the winner of Saturday's presidential poll, with opposition supporters chanting "Ali must go!" As chaos erupted on the streets outside, Bongo hailed the outcome of the election, which he declared had been "peaceful and transparent" despite the opposition crying foul. "I want to reiterate our primary victory: this election was exemplary," he said in his first remarks since the result was announced. Libreville, March 17, 2015 (AFP) - Strikes in schools, hospitals and in private business, along with a drop in vital oil revenues, have brought turbulent times for Gabon's President Ali Bongo Ondimba. Rallied by a score of trade unions in the public sector, teachers and health workers have stayed off work since the beginning of February to press home their wage claims, prompting the administration to dock pay. In weeks of rowdy negotiations, the strikers' representatives have made no concessions to the government of the densely forested equatorial African country, which benefits from plentiful oil reserves as well as tropical hardwood. Teachers' unions have threatened to write off the current academic year for students if the government refuses to meet their demands for a substantial rise in the minimum monthly salary from 80,000 CFA francs (122 euros, $129 dollars) to 300,000 CFA francs. "The government shot itself in the foot by deciding to cut the wages of striking staff," said a leader of the movement, Marcel Libama. "This pointless tactic won't affect our determination to pursue the struggle for our country. Classrooms have remained shut," he added. "This (school) year can no longer be salvaged." In rejecting the teachers' claims, the government argued that to comply would mean a spending hike "from 680 billion CFA francs (one billion euros, $1.1 billion) to 2,500 billion CFA francs per year ... which is insupportable for the smooth running of the state." But as so often in Gabon, the last word lies with the president, whose role it is to mediate during such clashes, though critics hold him primarily responsible for social discontent. Ali Bongo has ruled since a disputed presidential election in August 2009. The poll was held within three months after his father Omar Bongo died in office after leading the country for no fewer than 41 years. March 10, Bongo called for classes to resume, asserting that he had met the main demands of the strikers. According to his spokesman Alain-Claude Bilie By Nze, the president agreed to performance bonuses and the introduction of a "new pay scale". "We want something concrete!" countered an unimpressed maths teacher, asking not to be named. "What does it mean, 'to revise the pay system'? Are they going to raise our basic salary, yes or no?" Lambert, a high school teacher in the capital Libreville, earns a gross monthly income of 450,000 CFA francs (680 euros), on top of which he is paid a further 200,000 CFA francs in allowances for housing, transport and the like. "Some teachers with the same promotions, the same seniority as me obtain bonuses that can total twice as much," he complained. "It's all so crooked that no one understand it." "All civil servants are affected, not just we teachers," Lambert added. Recent strikes have also paralysed firms in the private sector. Gabon was nearly cut off from the rest of the world late in February and then early in March when workers at the main Internet provider Gabon Telecom walked off the job, demanding higher wages. During the first two weeks of December, oil workers also downed tools, heavily disrupting production and sparking major energy shortages in Libreville. Since oil accounts for 60 percent of state revenue, the tension undermined Bongo's regime. At the same time, many major infrastructure projects have ground to a standstill for lack of funds. Despite oil and mineral wealth, about a third of the population of some 1.6 million still lives in deep poverty. Less than two years ahead of the next presidential poll, the opposition is taking advantage of the groundswell of discontent to call on Bongo to step down. An opposition rally turned bloody in Libreville on December 22, with different sources reporting between one and three fatal casualties. The outcome of the last presidential poll in 2009 led to violence and looting in Port Gentil, the country's second city on the Atlantic and a hub of the oil and timber trades. "It's now more than 50 years that we've put up with the same family in power and nothing has changed for we 'makaya' (street people). We want change," young, unemployed Prospere told AFP.